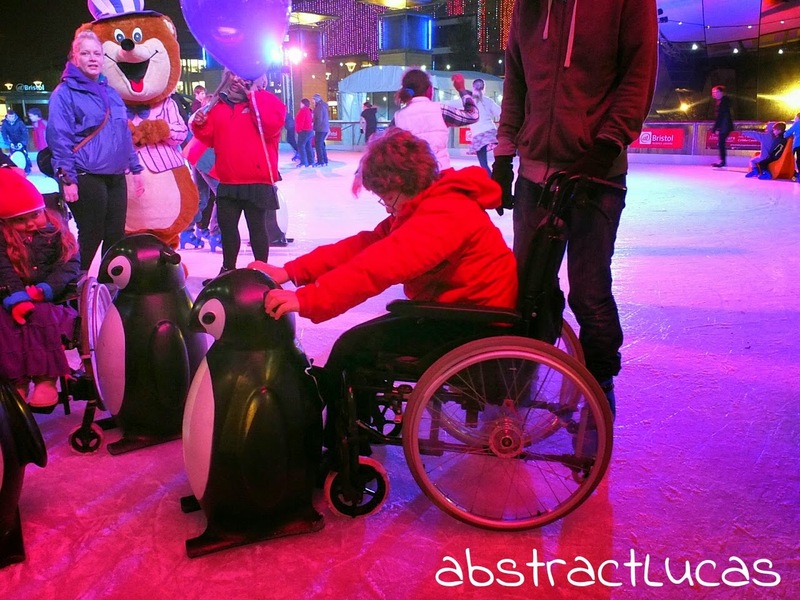 abstract Lucas : Accessible ice skating? Really? 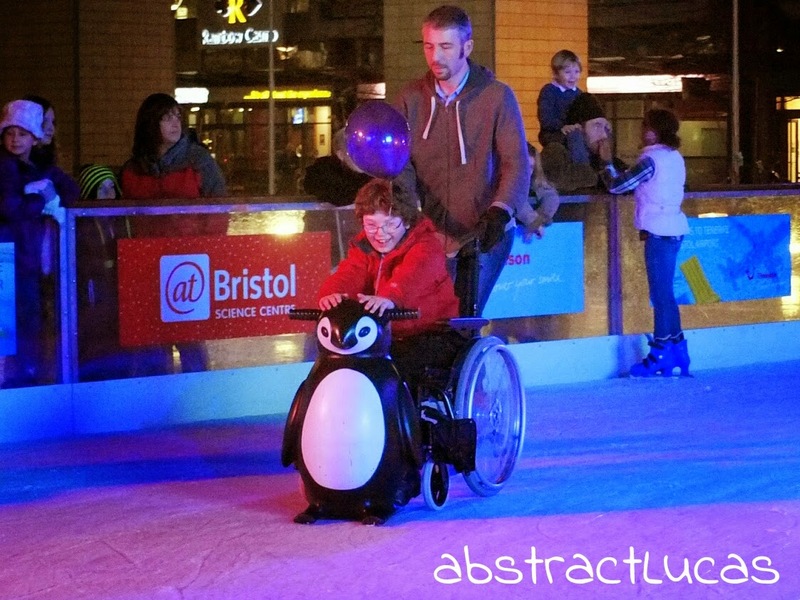 We're spoilt for choice in Bristol at this time of year - we get temporary outside skating rinks at Cribbs Causeway, another at a nearby garden centre, and a third in Millennium Square run by @Bristol. Everyone in Bristol knows the big shiny ball - an easy reference point for the kids! Cerebra (in conjunction with the children's hospital) organised a family session, and we were lucky enough to be drawn from the hat, so down we went. Staff were great, and not the slightest bit phased by umpteen kids in wheelchairs on the ice, or the couple of meltdowns that are inevitable with that kind of situation. Noah feel over a couple of times and was helped back to his feet by staff who managed to not make him feel self conscious about it at all - pretty impressive since he now seems to have reached that point in life where you want to be exactly the same as everyone else and falling over on the ice is so embarrassing you're pretty sure you wished you'd knocked yourself out just so you don't have to deal with seeing anyone notice that you fell. Petal, still at the 'look at me I'm invincible' stage of pre-puberty, has pretty good balance and kept calling out updates as to how many times she'd circled round and not yet fallen over - at least partly to rub salt in Noah's wounds I'm sure! 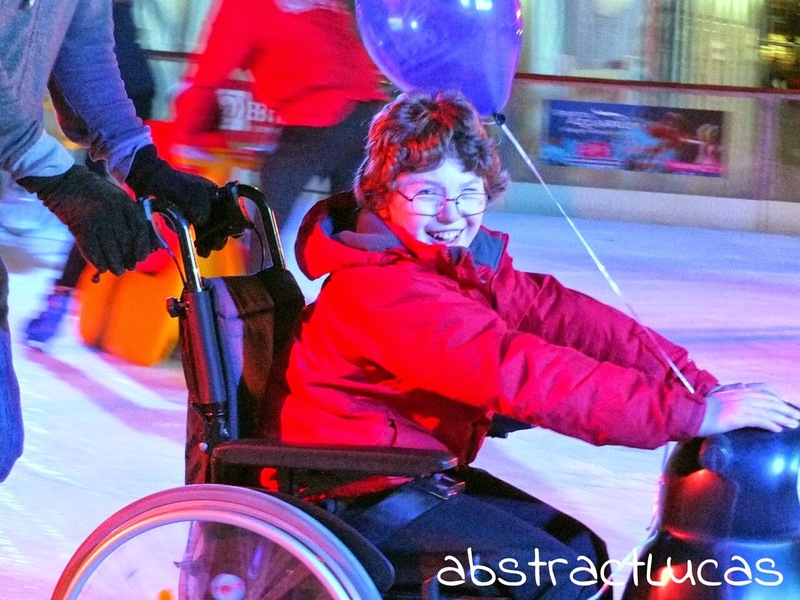 Smiler decided that just because he was in his wheelchair on the ice shouldn't mean he didn't get a turn with the penguins (think sliding walking frame for skaters otherwise reluctant to let go of the side), and since there were plenty it seemed reasonable... The look on his face says it all! What a fun day and great program! Love the photos! Thank you Lisa - everyone enjoyed themselves and while I love that last photo I really can't take any credit - it was a fluke shot that I happened to snap as he slid past! Thank you hon - not sure these young people of ours realise how tiring it can be to be the one doing the pushing, but the upside is that it makes it much easier to balance! I think the sensations - the movement, the breeze in their face, the lights and sounds - it all adds in. Hope you and Smiley get to go skating this winter too!